An American Art Nouveau Pair of gilt bronze and favrile glass "Three Light Lily" adjustable table lamps by, Tiffany Studios. 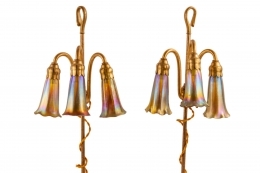 Each lamp is decorated with three matching Tiffany Favrile iridescent gold lily shades a top an original gilt bronze and acid etched adjustable lily bases. The bases are both signed,"Tiffany Studios New York 306" and the shades are all signed, "L.C.T."